Get That Money is an exploration of the many ways in which we think about our finances — what we earn, what we have, and what we want. 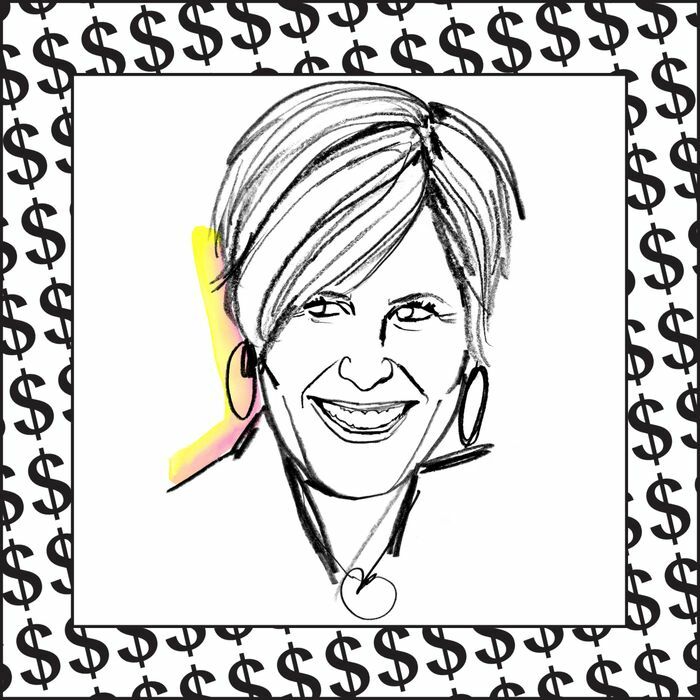 Suze Orman got famous (and very rich) for being “the money lady” — a tough-talking finance guru who delivered hard truths about your wallet with a bright, made-for-TV smile. She hosted CNBC’s top-rated Suze Orman Show for 13 years, won two Emmys, wrote nine consecutive New York Times best-sellers, appeared on Oprah countless times, and made millions selling personal finance programs on QVC. Then, in 2016, she decided to pack it in and retire. She settled down on a private island in the Bahamas with her partner Kathy “KT” Travis (they married in 2010) and took up fishing. But when the #MeToo and Time’s Up movements took off, Orman — who was a waitress for nine years before she became a stockbroker in 1980 — heard her calling. She came out of retirement, started a podcast, revised and rereleased her 2007 book Women & Money, and returned to the speaking circuit. These days, she responds to every single question she gets on Facebook, sleeps four hours a night, and still makes time for all-day fishing excursions. Here’s how she gets it done. I’m up and dressed by 5:30 a.m. and I go outside and look at the grounds. Does the pool need cleaning? What’s the condition of the sea? And I always listen to Morning Joe. I don’t watch it. I listen on my iPhone with TuneIn Premium so I don’t have to hear commercials. KT’s always like, “Why don’t you just turn on the damn TV?” But there’s something I like about just hearing voices. I’m not distracted by the funny look that Mika may give Joe, or what they’re wearing, any of that. All I have for breakfast is my “bullet” coffee. I make it with butter in the blender, and I love it more than anything. I’ll even have it for a late-night snack. The caffeine doesn’t bother me. I do intermittent fasting, so today I will not eat until 1 p.m. I’ll record some podcasts — I have a little studio off the bedroom for my podcasting — or I’ll write, or check email. This morning, I’ve already edited four articles. I’m not sure how this happens, but almost every day something comes in that keeps me busy until 7 p.m. Answering emails, fixing this thing, creating that product, doing another PBS special, where is it going be located, what’s the staging, who’s going to light it, who’s going to edit it. I used to work 20 hours a day, seven days a week. I went almost ten years without spending more than one day in the same place, unless I was taping my show. Then I would be in New York for three or four days, and then I would be off again. I still get up at 5 a.m. and go to bed at 1 a.m. I only need three or four hours of sleep. That’s it and I’m fine. Even today, I do the same thing. After KT goes to sleep, I stay up and listen to CNN and MSNBC. I never, ever, ever take a nap. KT loves to take a nap at 4 p.m. I can’t remember if I’ve ever taken a nap in my life. I don’t get tired. I don’t know why. When I was approaching 65, I noticed something about a lot of people who had been on the same shows I was on — The View, or Larry King Live: They needed to be defined by a standing ovation, by an audience. And I said, “KT, when I’m 65, I want to stop everything and see if I’m happy without it.” So in one year, I shut down the Suze Orman Show, I stopped Oprah and my speaking engagements, and I came off QVC. I sold all of our homes — the apartment we had in the Plaza, the home in San Francisco, the home in South Africa — stunning properties, they all went. And our five cars, or however many cars we had. I don’t even remember anymore. Gone. Bye! Everyone thought I was having a nervous breakdown. I only wanted to keep our little condo in Florida and the island. And KT was like “Okay, whatever.” Then we came to live on the island and I was so happy here. We had the time of our lives. But then the #MeToo movement started, and Time’s Up. And I said, “I have to go back.” I brought out my Women & Money book again, and my whole goal now is I want women to stand up for themselves, financially speaking. So that’s why I came out of retirement. I have 20 talks already booked just for this year. We’re striking deals again. But I’m not doing it for the money. I don’t need the money. I have more money than I’ll ever spend. We just started fishing a few years ago. Now, the island people call us “the fishing ladies.” I went from being “the money lady” to “the fishing lady.” And that was such an elevation in stature for me! We only catch fish that we eat. We’re not sports fisherwomen. I don’t like sports fisher-people. I don’t like when they go out and hook a fish just for fun. I think it’s cruel. I went from being “the money lady” to “the fishing lady.” And that was such an elevation in stature for me! First thing in the morning, I check the report on the tides, how strong the winds are going to be and what direction they’re going. And where is my moon? Right now, it’s the season for wahoo [a type of large fish that is notoriously difficult to catch]. I didn’t even know what a wahoo was two years ago. If I decide to go fishing, then KT and I, we go down to the boat with everything we need and we will fish for eight to ten hours. At the end of the day, if we caught anything, the fish have to get cleaned and be filleted. Before you know it, it’s 10:30 or 11 p.m. I met KT when I was about to turn 50. At that point, KT was a baby millionaire, and I was a significant millionaire — that’s how KT refers to it. From the start, we always kept our money separate, and our money is still separate to this day. KT’s career has been building brands, and I’m a brand. So now, KT is vital behind-the-scenes, making deals. She’s the one who says to me, “They’re paying you to do this thing.” I go, “How much? You asked for what? Really? And they said yes?” It always shocks me. Rather than me getting paid and KT getting a percentage of it, our contracts say, “You’re going to write separate checks directly to each of us.” So if KT and I ever break up, she still gets her percentage of the money from those deals, and she doesn’t have to worry about me saying, “Screw you.” She has her own money. That’s just how it is. When we buy something together, for the island or whatever, that’s where we combine money. If we’re buying something that’s four million dollars, KT will put in two and I’ll put in two. I’ve been gay my entire life, and everybody knew that I was gay. I was out. And a lot of the male brokers were sleeping with their secretaries. It was a very unhealthy culture — toxic, sexist, and oppressive. If the #MeToo movement had started back then, almost all the male brokers would have been fired. When I realized what was going on, I went in to the sales manager’s office and I said to him, “If you ever approach me in the wrong way, I’m gonna cut your little pecker off. Do you hear me?” But the strangest thing was, the men thought I could relate to them because I was gay. When they had strippers in the office for birthdays, they thought I would enjoy it. Those were some of the things that I had to put up with. My saying is, “When the dogs are barking, the elephant keeps walking.” And most of my career, the dogs were barking: “She doesn’t know what she’s talking about. She doesn’t have deep financial knowledge.” But I let them bark. Once you’ve made it big, people will come after you with everything they’ve got. Some people would say, “So, what are you hawking this week on QVC?” And I would just say, “Are you jealous because I’m wealthier than you?” And I would walk off. I don’t read the good things people say about me, and I don’t read the bad things either. That’s what got me through all the criticism, all the negativity. My show was the No. 1 show produced in CNBC for many years. They would refer to me as this blonde, white-toothed, whatever. But I rated higher. I used to have a watch collection. I loved expensive watches — $15,000, $30,000 watches. And I had quite a few of them. I used to have a watch collection. I loved expensive watches — $15,000, $30,000 watches. And I had quite a few of them. I didn’t wear them outside to impress people; I would just look at them because I considered them like pieces of art. Nobody even knew that I had this extensive, serious watch collection. It was just KT and me. Every once in a while, I would take them out and line them up and be like, “Oh my God, those are so beautiful!” Then gold prices went up to almost $2,000 an ounce and I sold them off. Who gives a damn about the watches? Now I spend my money on fishing lures. Yesterday, I spent the whole day rerigging 15 of them. I lined up all my fishing lures and I combed their feathers. Sometimes I put hair conditioner on them to make them softer. I was like, “Oh my God, this is what I used to do with my watches!” Nothing makes me happier than my fishing lures. My wardrobe now consists of Lululemon pants and flip-flops. Right now I’m wearing a shirt by Columbia, the sportswear company. I do not wear makeup when I’m on the island. I don’t care what my hair looks like. Nothing about my appearance matters to me besides being clean. The freedom of that is really incredible. Obviously when I speak somewhere, I dress up and I become the public persona Suze Orman again. I still go to the same hair people, and I’ll make a hair appointment and get a manicure and pedicure. Otherwise, I don’t care. KT is the one who cooks. She loves to cook, and I do not. And KT hates to do dishes, so I do them. We don’t like staff around us when it’s just KT and me. We might have someone come clean the house every couple of weeks, but that’s it. After dinner, I usually vacuum the floors and then we’ll go and take a sauna. We have an infrared sauna, so we’ll go and do that together for an hour. And then we take a shower together. KT and I usually do almost everything together. We work together, we fish together, we eat together. KT sets a formal setting for us at almost every meal. And still, we can’t get quite enough of each other. It’s a very strange thing. I don’t quite understand it. But it’s true! We do have a person who keeps track of our payments, because we have so many sources of income that have to be tracked. She makes sure everything is on time and that the money is there. And she does taxes for us. Barbara Walters once said to me, “Why are you always so damn happy?” And I said, “Because I never do anything anymore that I don’t want to do.” If I find something tedious, trust me, I will hire somebody to do it for me. But you know what’s tedious? It used to be that if I wanted to go somewhere, I had to call someone who would look into it and then come back and ask, “Do you want to leave at 10 a.m., 2 p.m., or 5 p.m.?” Then there’s this whole back and forth. It’s just easier if I do it myself. I book my own cars. Everything. I can’t believe I used to have people that did that for me. What a waste of time and money! I only do one thing at a time. I will forever think multitasking is the ruination of perfection. When I am doing my podcast, that’s all I’m doing. I’m not checking emails. When I am giving a talk, I am only giving a talk, because I’m not a scripted talent. I have no idea what I’m going to say beforehand. All my shows you’ve ever seen, none of them are scripted. That’s why, when I look in the camera, it’s different from when anybody else looks in the camera, because I am not reading a teleprompter. I am looking right into the middle of that camera that I love — I love cameras — and I can see you, and you can see me seeing you.